Two days ago, we removed the Google Buzz button from the top and bottom of each post on TechCrunch. No one noticed. Not a single person said a word about it. It wasn’t until earlier today when I tweeted about it that we got some feedback on the change (most of it being: “oh, I didn’t even notice”). As I tweeted, that in and of itself says a lot. The issue of Buzz being a viable sharing platform used to be somewhat of a hot-button issue. When I wrote a post last March noting that traffic coming our way from Buzz appeared to be less than that of a dead man, FriendFeed, many folks got up in arms. It turns out, my data was flawed — but it wasn’t necessarily wrong. You see, since Buzz runs within Gmail, which defaults to HTTPS, it scrubs the referrer data before sending the traffic our way. So, conveniently, the only way to measure Buzz traffic was to infer it. Like a black hole. But I’m now pretty convinced that Buzz is actually much more like a black hole in another way: we were sending links there, but nothing was coming back our way — meaning traffic. 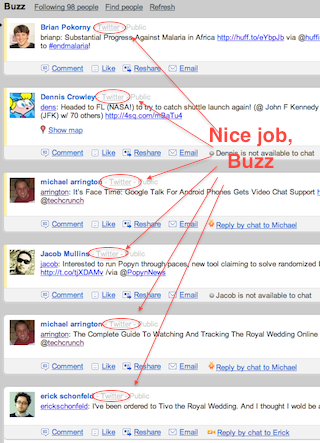 When we had the Buzz button live on TechCrunch, I was sending every one of my posts to my over 2,200 followers on Buzz. Mike was doing the same for TechCrunch posts to his over 1,500 followers by way of the tweets he auto-imported into Buzz. Most importantly, the TechCrunch Buzz account was sending a link to each story to the over 9,000 people that follow it. And yet, all but a very tiny amount of traffic is accounted for from the other major referring sites. Further, there were never any weird spikes in traffic sent by some unrecorded source. When a post is popular on services like Facebook, Twitter, Hacker News, Google News, Digg, StumbleUpon, Reddit, etc, we often see big spikes. There was never once a sign of that happening with Buzz — inferred or otherwise. And so that led to us removing the Buzz button yesterday. And again, no one said a word. So it will remain gone. We are planning for now to replace it with the new Facebook Send button (though a minor technical issue is holding up that deployment). That also says a lot. We will have two Facebook buttons (the Like button being the other) on the site and zero Google ones. I suspect when Google rolls out their +1 button, we’ll try that out. But that’s not really the same thing. Our data shows that the Facebook and Twitter buttons are being used a lot. And even the Digg button is every once in a while these days. But Buzz? More or less nada. And looking over my Buzz feed (which I haven’t done in months), it looks as if 99 percent of the content are tweets that are being auto-imported. And there’s basically no interaction on any of the items. Remember when Buzz was supposed to get its own standalone site? What ever happened to that? It does exist in Google Profiles now, but I’m sure it gets even less usage there than within Gmail. Remember when Google launched a Buzz API that no one uses? That was just about a year ago. We’ve been hearing rumblings for months that Google was considering scrapping Buzz altogether at some point in the future. That still may be in the cards now that social is a priority under new CEO Larry Page. As more of their social products begin to roll out, Buzz may in fact be Wave’d. The upcoming Google I/O conference will be telling. If we don’t hear anything about Buzz, I suspect Google may soon be telling it to — forgive me — buzz off. Like we just did.